You have arrived at a one-stop destination for home based cosmetic and household products business needs. We cater to those individuals who intend to start their own home based, hand-made cosmetic making business with minimum capital and infrastructure investment. We specialise in all kinds of training in both synthetic based products as well as all natural products like making bath soaps from scratch using Oils, Shampoos using synthetic materials and herbal shampoos, hair conditioners with goodness of all natural ingredients and detergents without machinery. We are situated in Mumbai Jogeshwari west and our many students from with local Mumbai and from Maharashtra, out of Station North to south India ,East to west India , International student From Austria ,South Africa, Dubai , Bahrain,Tanzania ,Saoudi Arabia , Bangladesh ,Shrilanka ,Nepal ,USA . Our Clint From Various Field : Doctors from various field Like : Ayurvedic doctors ,Homeopathic Doctors , Dermatologist , cosmetologist ,Beautician Personal care and Home Care Manufacturers ,Freshers , Homemakers . Our academy and learning institute has professionals who have an experience of more than 30 years the art of soap, Cosmetics & Home Care . It becomes easier to make soap/cosmetic/Home Care when you are provided with the basic knowledge of soap making from an experienced Institute. 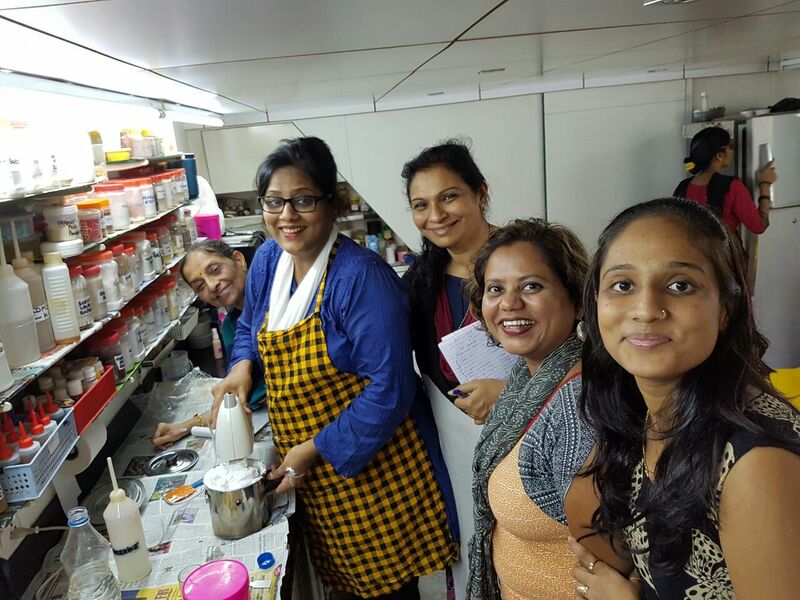 Want to learn about soap, detergent, cosmetic, skin care, hair care, spa, household products, candle making, agarbatti making and don’t know where to find someone to learn from? Looking for raw materials, moulds, containers, bottles and other tools and supplies in small quantities for the above and cannot find it? Looking for something different for return gifts for birthday parties, for corporate gifting, gifting to your loved ones or family and friends, or simply for your own consumption?